Since the first Pascal release this past spring, NVIDIA has rolled-out a handful of high-end (and really high-end) GPUs, so now, it’s time to get the low-end settled. That’s fulfilled with the release of the GeForce GTX 1050 and GTX 1050 Ti – both 75W parts. Priced at $109 and $139, respectively, both cards target the 1080p resolution. Let’s see how they fare against each other, and AMD’s Radeon RX 460. Thanks to the fact that DICE cares more about PC gaming than most developers, the Battlefield series continues to give us titles that are well-worth benchmarking. 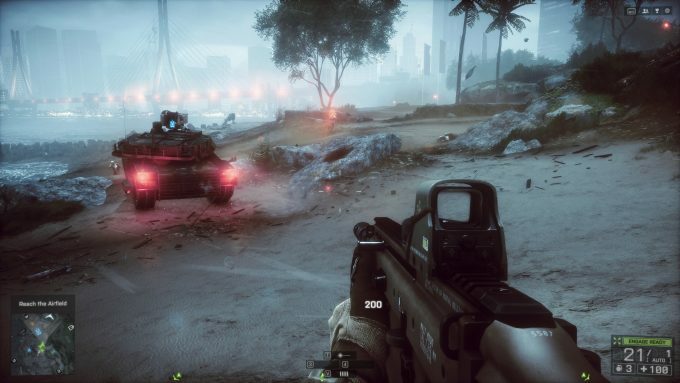 While Battlefield 4 is growing a little long in the tooth, it’s still a great test at high resolutions. Testing: The game’s Singapore level is chosen for testing, as it provides a lot of action that can greatly affect the framerate. The saved game we use starts us off on an airboat that we must steer towards shore, at which point a huge firefight commences. After the accompanying tank gets past a hump in the middle of the beach, the test is stopped. With Battlefield 1 having just been released, our beloved BF4 benchmark will soon go out to pasture. It seems a little inappropriate to finish our run with this game off with low-end cards, but at the same time, we’re still seeing about 60 FPS from both the GTX 1050 and 1050 Ti, which is pretty impressive given we’re dealing with Ultra detail. Despite being in a similar league, AMD’s RX 460 fell behind. Far behind. This is a theme I saw all throughout retesting. 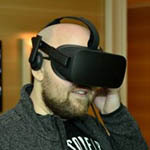 I had imagined that the performance would be very close between the two, but it feels like NVIDIA’s 2GB card handles tough situations a bit better than AMD’s. 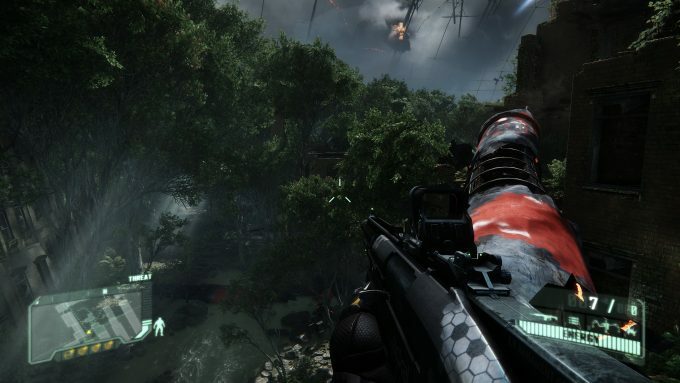 Like Battlefield 4, Crysis 3 is getting a little up there in years. Fortunately, though, that doesn’t matter, because the game is still more intensive than most current titles. Even though the game came out in 2013, if you’re able to equip Very High settings at your resolution of choice, you’re in a great spot. Testing: The game’s Red Star Rising level is chosen for benchmarking here, with the lowest difficulty level chosen (dying during a benchmarking run is a little infuriating!) The level starts us out in a broken-down building and leads us down to a river, where we need to activate an alien device. Once this is done, the player is run back underneath a nearby roof, at which point the benchmark ends. 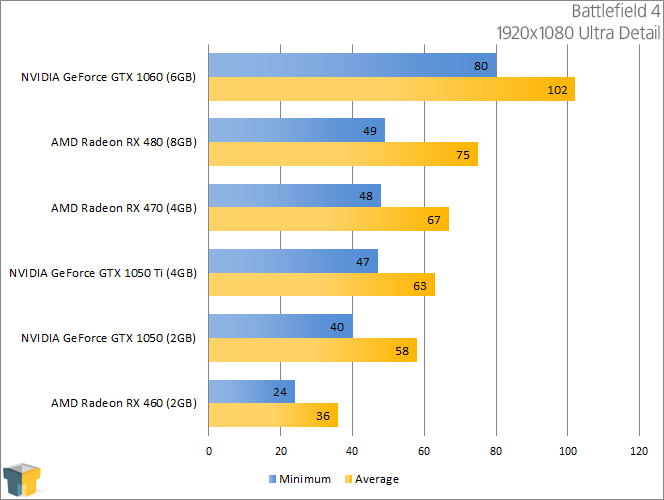 Yet again, NVIDIA’s GTX 1050 jumps well ahead of AMD’s RX 460, although the performance between the GTX 1050 and 1050 Ti is almost nonexistent. As mentioned on the first page, though, we’re using extremely high graphics settings across all of our games, so if you spend time tweaking, the differences will be more apparent (that will be tackled in a follow-up article). 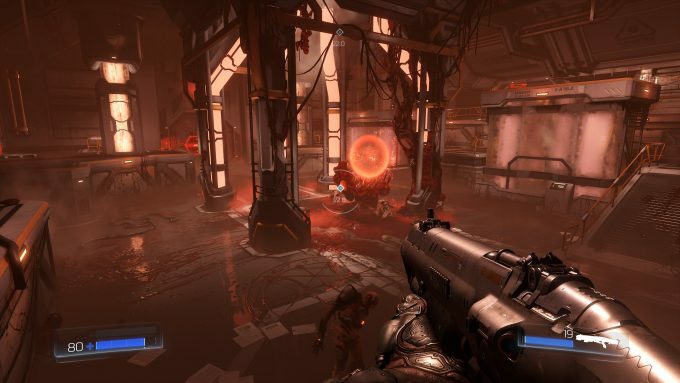 DOOM 3 was released a couple of months before Techgage launched (March 1, 2005, for the record), and it was a game featured in our GPU testing right from the get-go. For this reason, this latest DOOM feels a bit special, even though it follows DOOM 3 up eleven years later. 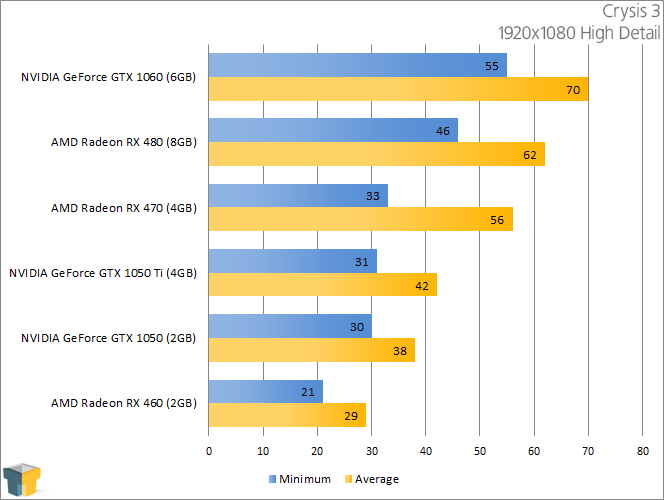 As we hoped, the game proves to be more than suitable for GPU benchmarking. Testing: Due to time constraints, an ideal level could not be chosen for benchmarking. Instead, our test location starts us off at the bottom of a short set of stairs early on in the game, where we must climb them, open up a door, and then go to a big room where demons are taken care of and the benchmark is stopped. 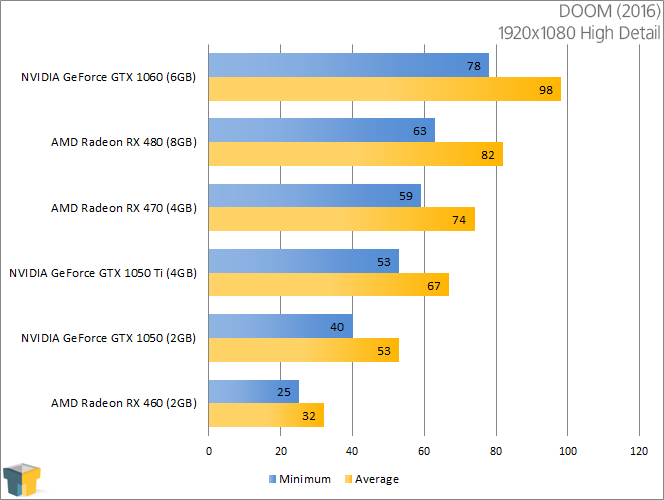 The GTX 1050 Ti has no problem pushing DOOM beyond 60 FPS at 1080p, separating itself by a good margin from the non-Ti model. This is one of those games where a larger framebuffer can make a big difference, even at the modest resolution of 1080p. AMD’s RX 460 once again struggled hard. Note that Vulkan should improve that situation, but again, time prevented me from doing as much testing as I wanted to.